Hobbyists want to see metal detecting finds. Everyone who is involved with metal detecting sooner or later wants to show off their finds, or tell a story about how they located them. And we all like to see those pictures, and hear the stories. Now is a perfect time to do that. You may have an interesting story to tell, with some pictures, now is the time to share your metal detecting finds with the rest of us. Don't worry about writing the next great piece of literature. You're not being judged on how well you write. Just tell us a brief story about your best metal detector finds. Also, if I find any material to be offensive, I will edit, or delete completely. I found the Revolutionary War buckle above while metal detecting an ares used during both the French & Indian War, and the Revolutionary War. It was a site I was researching for one of my TV shows. So go ahead and tell us your metal detecting story. It's easy to do. And don't forget to add some pictures. Your story will not be added if you do not have pictures. After your story and pictures are posted by me on your website page, that’s right, you'll actually be building your own unique webpage. And after that page is posted by me you will be able to share your page with your friends at Facebook, Twitter, or any social website. See what others have created with their stories and pictures. Here is a directory of metal detecting stories. What’s Your Metal Detecting Story? 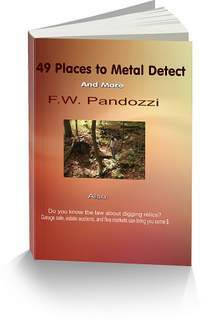 Many of us would like to read about your metal detecting stories, and see pictures of your finds. Here is your chance to share your stories and your finds with others. Just upload a picture, as well a brief story about how you located your find. Share with us here at my website...And share your picture and story with your friends. You'll be able to do so with a link of your own. Have fun with this, create your own page. Begin by entering a title of your story. Share your story – tell us how you found your stuff. Post a picture of yourself if you'd like. Tell us something about you and where your from. Perhaps you'll meet a detect'en partner, or a new friend. Either way, your story will appear on a Web page exactly the way you enter it here. You can wrap a word in square brackets to make it appear bold. For example [my story] would show as my story on the Web page containing your story. Have fun, and tell us all about your metal detecting finds. I may edit your story for clarity. To upload your picture, click the button and find it on your computer. Then select it. Come on! Don't be Shy! Share your Stories! After you post your story, and your picture, show your friends at Facebook, Instagram or Twitter. See what others have found. Go here for a directory of metal detecting stories. Please feel free to comment on others finds, but be nice! I will delete negative comments. And who knows, you may find a treasure hunting pal. Found this 40yrs ago in a park in Detroit around 7mile and vandyke please tell me what it is? Good day of detecting at an old farm house belonging to a friend in Central NY. Just wondering if someone knows what it is ?? ?